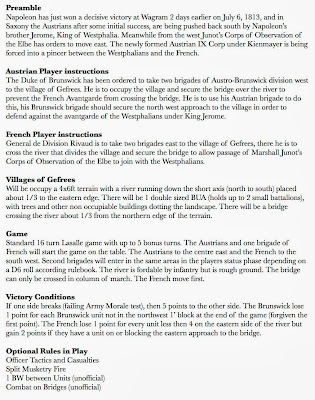 A couple of days ago I reprised the Battle of Gefrees using the Lasalle ruleset. I had acted as a gamemaster for this game in April using the Rank and File rules. I have a small brigade of Austrians and have almost completed the Brunswick corps so I was keen to get them in action. I got the idea for the scenario from Wargames Soldiers and Strategy issue 63. The Battle of Gefrees is one of the few historical battles where I could field this allied force. I built on the scenario and we had a nice game with a clear Austro-Brunswick victory. I thought I would re jig the game for Lasalle. Since there was no gamemaster this time, I laid out the full scenario. I played with the victory conditions a bit, but generally the game was as before. In the last game with this scenario the French appeared to have a tough time, so I toughened up their légere and added a unit of cavalry, I also took away a unit of Austrian artillery but added a unit of Brunswick Hussars. 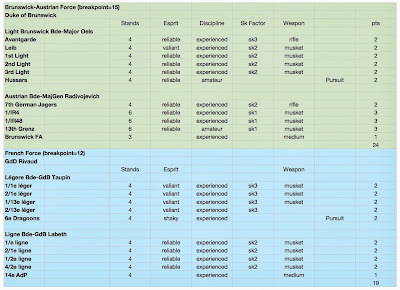 I took the attributes for the cavalry from the magazine, but otherwise all the rating are from the rulebook for the Liberation period. Recently I made contact with the Adam, the Fencing Frog, through the Lasalle forum. He was keen to learn Lasalle, so last Thursday we met up at the Hobby Bunker in Malden and had a game. He is a great guy, and despite not having played Lasalle before he picked up the game without difficulty. He picked it up so well, he in fact trounced me! It all started well, I probably laid out the terrain a little bit tougher then I could have for the Austro-Brunswick force who essentially had to fight a defensive action. I thought it only fair that we dice for the sub-commander atributes just before the battle started. Adam threw successive 5's and 6's for his two French brigadiers, while I was less lucky. It started to dawn on me that this might not be so easy, both Adam's brigadiers were superb tacticians with vigorous leadership skills. In Lasalle terms this meant that that troops under their command would hit on 4 in combat rather then on 5 and that he could rally them on a throw of 2. My Brunswick brigade general did end up also being a superb tactician, but this was really little value to me as the main troops I had to use in combat where my Austrians. I also broke down my jaegers and Brunswick avant guard battalions in order to strengthen the sk factor on my line units. All the Brunswick units ended up with SK3 as well as the Germans, the Hungarians and Grenzers went to SK2. 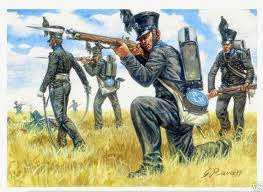 Adam elects to send in his light brigade first, I thought this was a mistake as his cannon were with his line infantry. Wrong about that as his dragoons caused no end of havoc. Th Austrians rapidly advance in line, two units to the north with the Brunswick cannon and one unit to the south. The French advance is quite rapid and their avantgard cross the river with the Austrians nowhere to be seen. Turn 3 sees the second French brigade enter Gefrees. Aside from the Dragoon skirmishers and the cannon these troop are Adams, the green faced troops are Irish rebels in the service of the French tyrant. The legere have almost completely crossed the river, finally the Austrian ponderously maneuver in attack column. The Austrian guns fire with no effect. Finally, the Brunswick brigade enter Gefrees, but they are stuck on sentry duty. 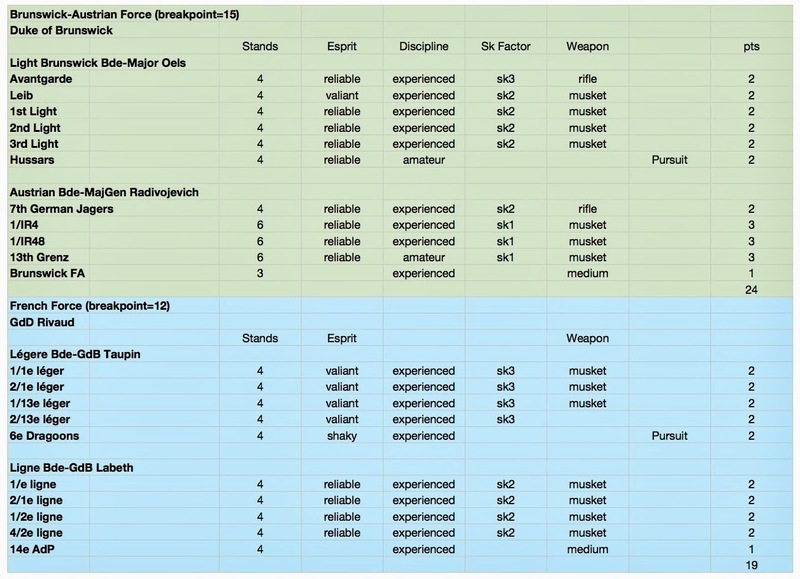 I recently did a bunch of skirmish movement stands (these are from Warbases), I really do not like to refer to paper in a game, 3 skirmishers represent a SK value of 3, three photos back you can see the 2 sk stands with the dragoons. Finally some action the French legere engage the Austrians, taking damage from their guns and the Brunswick cannon. As you can see in the far ground the dragoons have attacked the Grenzers, they elect to fire rather then forming line. I was worried where they were amateurs they would fail the discipline test to maneuver under threat. The legere are broken but the French advance is relentless with the ligne now crossing the river. Un fortunately not so much success as the dragoons break the Grenzers. despite taking casualties in their charge. I had advanced the Hussars from sentry duty to aid the Grenzers but just not enough room for countercharge. The Austrians form into line to increase their fire power, but the German battalion has already taken 4 DISR. The Brunswick Lieb are also advanced to the south, and the Hussars charge the Dragoons, it should be a easy victory, they outclass them in espirit and and the dragoons have taken casualties. The dice gods fail me and they are broken. The Germans have been driven back by the legere and now the French have engaged the Hungarians. The Hungarians break. Now victory is looking in serious doubt, I have caused damage to the French and I need one more of their units to fall in order to force them to take morale tests, unfortunately I am rapidly approaching my break point as well. The Germans are seriously undermanned, their lines are getting shaky another valiant French legere battalion attacks and they break. I surrender. It was a really fun game and Adam was a pleasure with whom to game. We are hoping to get another game in a couple of weeks. The Lasalle rules worked well, and we really had to refer to the book only on the rare occasion. I certainly made some mistakes, should have got more Brunswickers in the fray and like Silly Billy I have to learn to form square when cavalry is in sight. But for his first game with these rules Adam really played it well. By the way, Adam has some excellent photos from the game on his blog, have a look. Game looks great, and it sounds like you had fun. Nothing like having an amiable opponent close by! 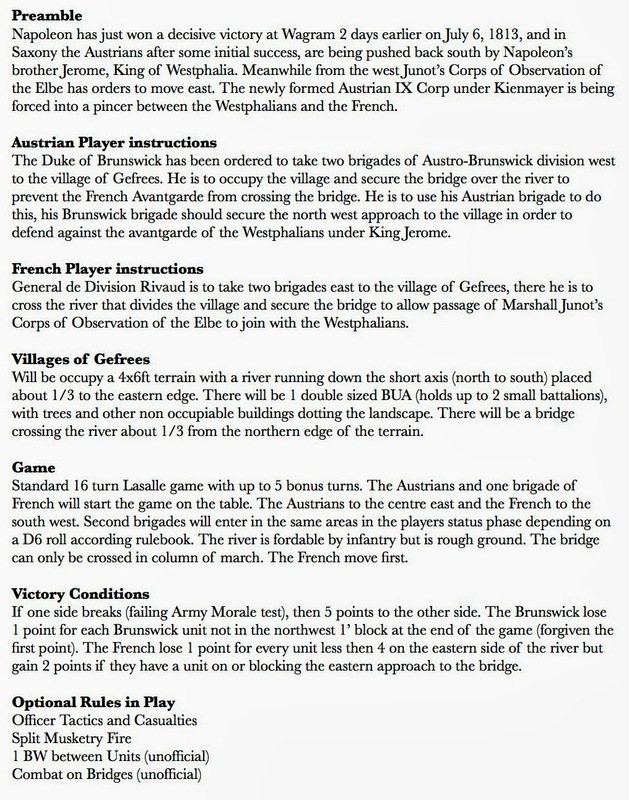 As you seem to keep coming back to "Lasalle" is that ruleset becoming your go-to for Napoleonics? Mr Mustafa's "Longstreet" has become my primary ACW ruleset by the way. Great looking game. I'm used to seeing Lasalle in 15mm, so it's interesting to see it played in another scale. Excellent AAR with many nice pics - thank you for sharing. Also: The Lasalle rules worked well, and we really had to refer to the book only on the rare occasion. I hear that often but they really felt a bit too leight-weight to me. I was under the impression that the mechanics were more important than the actual game. A great looking game and really interesting report. Always great to have another wargaming friend/opponent! Great looking game John! Very colorful troops as well. Nice game indeed. It looks like it went more the way of your own test game this time. And your opponent surely had the guts to cross the river with all the lads at once. Only the Dark Ages style village looks a little odd. I found your buildings were looking better on the tabletop. Looks like it was a fun game. Better yet, it's great that you've found a gamer near to your home! Good looking game. Nice to see you give Lasalle another crack.